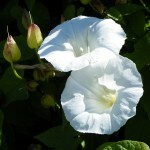 “Do you know how to get rid of bindweed?” said my husband over breakfast this morning, with a know-it-all air. For a second, I thought he was going to deliver the revelation that would transform the garden for the better. Finally! Victory would be mine. He sat back and said (rather smugly, if you must know): “We pay £10,000 and someone comes and digs up the whole garden to three feet deep. Keith had it done with a property he inherited”. Hmmm, not the answer I was looking for. I really could do with getting rid of the bindweed though. As I have mentioned before, when we moved in the garden was a mess. The previous occupants had used it as a rubbish dump for 10 years; when they were repossessed, the garden was deemed a public health hazard and it took four skips to clear it out. When we moved in, the garden was covered in weeds and waist-high brambles. Rather like Sleeping Beauty’s castle, if Sleeping Beauty’s castle was a former council terrace. Three years later, we have a lawn and the brambles have been mostly relegated to the corners (good for blackberries, come autumn) but the bindweed is everywhere and it is so difficult to get rid of. At the beginning of every summer, it comes up through the lawn and grows up into the hedges at a phenomenal rate. If I don’t clear it, it carpets the garden and the hedges in no time at all. I can keep it under control, but it’s a lot of hard work. Bindweed is one of those annoying plants that will not die: its brittle root systems meander around underground, popping up shoots whenever they feel like it. The roots are brittle, so if you try and pull them out they break off in your hand; the broken pieces continue to grow underground, turning one bindweed plant into two. Because the roots are so long, grow through tightly packed earth and grow so quickly, they are very difficult to eradicate. I have bindweed on the brain this weekend, because I have made a tentative start digging over the big, messy mound of earth at the back of the garden (in line with my New Year’s Resolutions). When I began digging, it seemed as if there as much bindweed root as there was soil. 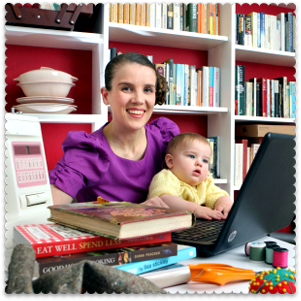 I filled a bucket within minutes – and the space I cleared was pathetically small. I also unearthed a pile of non-biodegradable rubbish, which I guess is the norm when digging over a former rubbish tip. An iron bar, half a plastic action figure, broken bricks, a teething ring, crisp and sweet packets… Nice! One of the crisp packets (Space Invaders, no less) had a best before date of 1977. So perhaps this bindweed infestation goes back even further than I had thought. This particular heap of soil/bindweed is destined for a skip, but what about the rest of it? Errrrrrrrgh, what can I do? Annoyingly the lawn-friendly weedkiller stuff has no effect. 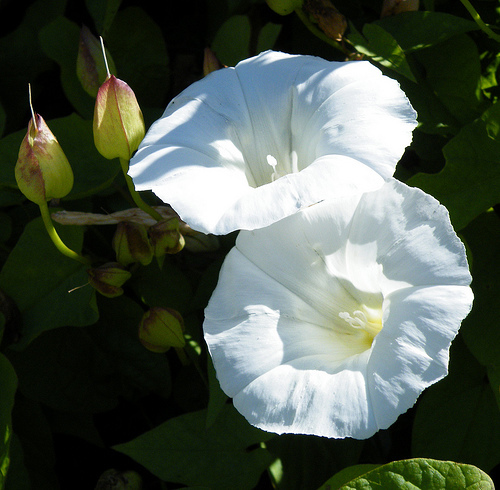 Bindweed, it seems, is the post-nuclear cockroach of the weed world. I’m not going to pay £10,000, that’s for sure. It could be worse: it could be the dreaded Japanese knotweed. (Have you seen this horrible video of knotweed growing through the floors of someone’s house?) Even so, I want rid. A fourth summer of bindweed clearance looms. Any thrifty ideas? Please? We manage to keep ours under control with a strong weedkiller, but you have to wait until the leaves are big and then pile as many leaves as possible into a plastic bag then spray the killer into the bag. I’m guessing this is not friendly to the environment in any way. Thankfully the weed is not in our garden any more, but sadly the infestation comes from next door and they seem not to care! good luck with it, my sympathy is with you. The only way to get rid of bindweed is to treat it with a weedkiller. Digging it up only breaks the roots into small pieces which regenerate into yet more bindweed. Sorry, but sometimes such non-organic steps are necessary…. Fill disposable container with systemic weedkiller (the sort that travels down and kills roots). Don rubber gloves. Dip hands now clad in rubber gloves in weedkiller and caress the bindweed all over, taking care not to get weedkiller on anything else. When you are finished, dispose of the container any leftover weedkiller and gloves carefully. You may need to repeat this exercise at intervals throughout the summer, but it does (eventually) work. If your bindweed is hard to access, stick a bamboo cane in the ground close enough that it will grow up it. When there is sufficient growth, get out the weedkiller and the rubber gloves. To have it in a lawn is truly terrible. The other comments clearly come from experience and are good. The most powerful weedkillers you can get are often found at commercial suppliers If you can get any of them you MUST use on a windless day for obviopus reasons. You should also wear a mask yourself and gloves. You will probabaly have to use several applications. I don’t know what bindweed is, but I use a combination of Dawn original dish soap, white vinegar, bleach and water on all my weeds and it works great. You only use a little bit of bleach, mix it all together and spray and pour on the weeds. Sorry, you can also add salt, like it says in the Bible, nothing will grow from salt. Glyphosate weedkiller, you can paint it onto the leaves then it will be drawn down into the roots. i have Bindweed growing through the walls inside my house onto my window sills , also up through the patio and well as in my garden…?